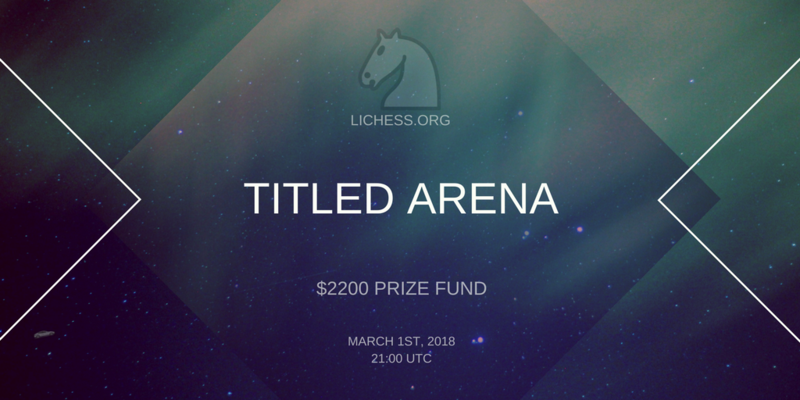 The Lichess Titled Arena returns with a $2200 prize pool! The two previous Lichess Titled Arenas were a huge success. 148 titled players played in the previous one, including Magnus Carlsen and Fabiano Caruana. Magnus donated his first prize back to Lichess (again! ), so this time we'll have a jackpot first prize of $1500. We also received a generous donation of $200 specifically earmarked for this tournament, so we increased the prizes for places 2 through 5 as well. If you are new to Lichess, it's important to become familiar with the arena format. Read our FAQ and try out a tournament in advance. Arena points are awarded based on the number of games you win. You can late-join, withdraw or rejoin at any time. Prizes will be awarded within 3 days after the event, through PayPal. In the event of a tie, the prize(s) will be split. Or: Take a picture of your ID document and send it to contact@lichess.org, along with a link to your FIDE card. Or: Publish a statement about Lichess on a website where you are recognized as who you claim to be. It could be Twitter, Facebook, chess.com, ICC, or anything serious enough. Send us a link to your post.